546 pp, 250 B/W photographs, plus appendices, bibliography, and index. Paperback 6” x 9”, $35.00. Scroll down for Editorial Reviews, Amazon Customer Reviews, and Praise from Readers. In 1942 at age seventeen, and like a lot of other youths anxious to do their part in the war effort, Bill McGee joined the U.S. Navy and was assigned to the U.S. Naval Armed Guard, the branch of the Navy that protected merchant ships and their valuable cargo and crew from enemy attacks. On his first voyage to the South Pacific, between New Caledonia and Guadalcanal, his Task Unit 32.4.4 suffered two major enemy attacks: the first by air (the largest Japanese air attack since Pearl Harbor); the second by torpedoes. Of the four Liberty ships in McGee’s Task Unit, only one remained afloat… the SS Nathaniel Currier, the ship McGee was on. Written in his signature straightforward style, McGee tells an honest, factual story that takes the reader through the Pacific war zones on Liberty and Victory ships, to nuclear tests, and from South Sea native customs to marathon poker games. Bluejacket Odyssey is a personal account of a defining period in our nation’s history. Memoirs of World War II duty on board naval combatant vessels of every type crowd the bookshelves, but little has been written about service in the Armed Guard, in which nearly 145,000 men served. 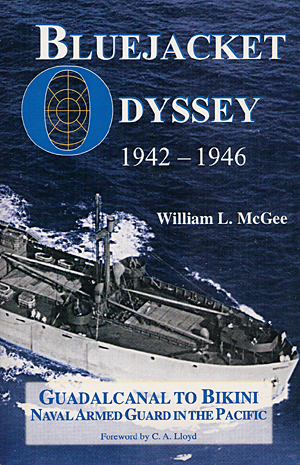 William L. McGee, in “Bluejacket Odyssey,” remedies this deficiency to the extent that one volume can….Drawing upon a meticulously maintained diary, McGee’s report is written from the viewpoint of the enlisted man….The greatest merit of “Bluejacket Odyssey” is that it offers a clear picture of the duties and dangers of service in the Armed Guard. As a source of first-hand information on this type of naval experience, the book has value for historians. War called McGee toward the sea to make ships. At 17, he enlisted. The Marine physical ruled him out, so he joined the Navy. The fastest way to the open sea, and the war waged for its control, was through gunnery school and a berth aboard a merchant vessel as a member of the Navy’s Armed Guard….McGee and his shipmates lived through a series of surprises, their world expanded as for puppies escaped from their world in a cardboard box. Innocence gave way to experience to the survivors. After war’s end, McGee was reassigned to a modern warship. He sailed aboard it to a long, memorable post-war Navy experience: the beautiful, but sobering, Bikini Atoll atomic bomb tests….In four years, McGee grew away from the innocent, young cowboy—who didn’t get away with using ‘heck’ or ‘darn’—into the salty life of a young sailor in a world at war … He tells his story with a candid eye, and without embellishment. It’s McGee’s honesty, clarity, and respect for his subject, that impresses. The story of a generation of Armed Guards …Well written, the book is an honest, factual story—laced with humor. The real color is revealed through McGee’s detailed daily journal, interviews with former shipmates, and declassified documents. All is further brought to life via photos and illustrations in an in-depth look at one aspect of wartime adventure.